When the cards first came, I posted a picture of it on flickr as it actually was – with my entire address online. Thanks to a kind and intelligent friend pointing out how incredibly stupid that was, I have this adjusted, blotted out picture. 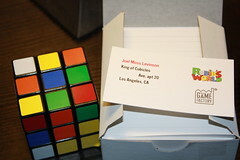 PS – though the Rubik’s Cube wasn’t part of my present, since the game the contest was for is the “Rubik’s World” game, I thought I’d put it in the picture. I bought it a few weeks ago and learned to do it, so at some point I’ll make a video of that and post it just to prove I can. « Best Contest I’ve Ever Seen?